These are my informal wine reviews of various wines that I have sampled recently. Most are affordable wines that are easily available through local wine retailers in the US. For more wine information, you can also take a look at this article on the different types of wine, or this overview of food and wine pairing. You can also enter your own wine reviews or wine recommendations, by scrolling to the bottom of the page and submitting the form below. 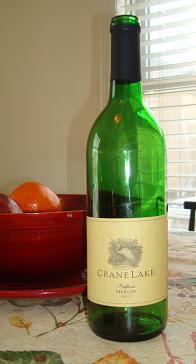 Crane Lake Merlot 2007 – For the price ($5.99 at my local liquor store), this is a very drinkable California wine. The most enjoyable part was the wonderful fruity aroma on opening the wine. Unfortunately, the taste of the wine did not live up to the fruitiness, although it still drank quite well (although not particularly reminiscent of Merlot). A little on the acidic side, so I found it better chilled. Not much of a finish to it, but an excellent value considering the low cost. J. Lohr Merlot Los Osos Paso Robles 2007 – a good, fruity Merlot from the Paso Robles wine region in California. Nice aroma and flavors of blackberry and cherry. Hint of licorice. I thoroughly enjoyed this wine. Turning Leaf Pinot Noir 2007 – Pleasant aroma of dried berries, but not as much fruit taste as I would prefer. Had the typical Pinot earthiness, but a little too acidic. Best slightly chilled. Although Turning Leaf is a California winery, this Pinot Noir is actually imported from Germany. McWilliam's Hanwood Estate Pinot Noir 2008 – I enjoyed this Pinot with a mushroom risotto (use some of the wine in the dish), with the earthiness of the mushrooms complementing the earthiness of the Pinot really nicely. Nice cherry notes and not too much tannin, as a Pinot should be. From the back label: "The McWilliam family has been at the forefront of Australian winemaking since 1877. Drawing on six generations of winemaking experience, McWilliam's has crafted a classic Australian Pinot Noir using premium grapes from some of South Eastern Australia's most renowned grape regions. This wine features ripe cherry fruit aromas highlighted by a plush dark berry palate with fine tannins to enrich the wine's smooth texture. Roast duck or grilled tuna complement the intensity and depth of this excellently structured wine." Blackstone Winemaker's Select Pinot Noir 2009 – Blackstone Pinot Noir comes from Blackstone Winery in Sonoma County, California. It had a nice bright ruby color, fresh fruit aromas (mostly black cherry) with a lingering earthiness and a touch of smoke. It was quite enjoyable for an economical Pinot Noir wine. Click here to read the rest of the Blackstone Pinot Noir wine review. Click here for more on Pinot Noir wine. Concha Y Toro Frontera Cabernet Sauvignon/Merlot 2009 – This is a very economical wine from Chile's central valley, and a great choice for the money. Certainly, it doesn't have the complexity of bouquet and finish of a more expensive wine. But it is a pleasant accompaniment to dinner and an enjoyable "cheap" wine. The Concha Y Toro Frontera has a light, dry berry flavor, and is surprisingly mild for a cab/merlot blend (the label says it's 85% cabernet sauvignon and 15% merlot) with quite soft tannins. I didn't find it had much of a finish to speak of, though. According to the winemaker, "The wine is fruity with aromas of chocolate, black plums and vanilla. A medium body gives way to black cherry flavors, soft tannins and a pleasing finish. Frontera Cabernet Sauvignon/Merlot is excellent with red meats, rich pastas, and firm cheeses." We enjoyed it with a simple lasagna and a side salad, and it was a very nice accompaniment with dinner. Fat Barrel Cabernet Sauvignon/Shiraz 2011 – This is another excellent, affordable cab blend from South Africa. Definitely worth a try. Read my review of this and other Fat Barrel wine here. A by Acacia Chardonnay 2008 – A by Acacia is a nice reasonably priced Chardonnay from Acacia Winery located in Napa Valley's Carneros wine region in California. It has a crisp fruit aroma of pear and green apples. On tasting, it felt initially sweet to the tongue. That was followed by a dryer follow-through, and a finish of warm toast. Click here to read the rest of the Acacia Winery A by Acacia Chardonnay review. Cavit Pinot Grigio 2008 – This is an Italian wine from the delle Venezie region, made from grapes grown in Trentino's Adige River Valley. Light, slightly fruity aroma. Quite acidic with a very light, fruity taste of tart green apple and a hint of citrus. But overall the flavors were too weak and there was a little too much bitter tartness. Our assessment is that this was a fairly average wine. It was budget priced (just over $10 at our local liquor store), but still there are better white wines for the money. Bella Sera Pinot Grigio – This is a refreshing, lightly floral and citrusy Italian white wine. This Pinot Grigio makes a very pleasant before-dinner drink, served well chilled. For more, check out the rest of my review on the Pinot Grigio wine page. Click here for more information on Pinot Grigio wines. Polka Dot Riesling 2006 – This was a lovely, reasonably priced, medium sweet Reisling from the Pfalz region of Germany. Nice fruity aroma with a touch of floral. Rich, supple mouth feel. Fruity with nectarine, apple and a hint of tropical fruit flavors. From the back label: "Polka Dot Riesling balances floral aromas and with ripe fruit flavors of pear, nectarine and apricot. Crafted in a medium sweet style, Polka Dot pairs easily with a wide range of foods and it’s great to enjoy with friends." Rehm Riesling 2007 – This Riesling had a very light, fruity aroma. The taste is slightly sweet (off-dry), and fruity with grape, citrus, and a hint of melon. Good acidity to balance, and nice and refreshing. This is an economically-priced (around $10) Riesling from the Pfaltz region of Germany. Although it wasn't my favorite Riesling, it was a pleasant accompaniment to sushi. Fat Barrel Sauvignon Blanc 2011 – This was a very nice, affordable, grapefruity Sauvignon Blanc. Read my wine reviews of this and other Fat Barrel wine here. Ferrari-Carano Fumé Blanc 2008 – Wonderful fruity aroma of melon with citrus. It has an excellent supple mouthfeel with fruity grapefruit and melon flavors. A little less citrussy than many Sauvignons Blanc's. Hint of lingering pineapple also. This California wine is from Sonoma Sauvignon Blanc grapes, partially aged in oak to give just a hint of oakiness. I found it yummy with some fresh goat cheese and light crackers with a touch of black olives. It would also be great with light seafood dishes. Wente Sauvignon Blanc 2009 – I thoroughly enjoyed this Sauvignon Blanc from the Wente winery in California's Livermore Valley. It has a lovely light yellow color and a crisp, slightly sweet, fruity aroma with citrus, apple, and a hint of melon. On tasting, it has the typical dry, pleasantly acidic citrus flavor of Sauvignon Blanc, with a touch of dry pear (in a nice way) and grapefruit. Very refreshing, and a good value at about $13 a bottle locally. Click here to read the rest of the Wente Sauvignon Blanc review.